When my husband and I first moved in together, we weren’t yet husband and wife. (We were engaged to be married and were a year later). We also weren’t two people with a lot of disposable income. Actually very little disposable income. Finances were so tight, that I kept a record of every dollar we spent. What wasn’t absolutely necessary, wasn’t purchased. Except for one thing. I wanted (not needed, but deeply wanted) a real live Christmas tree. Growing up my family always had an artificial tree. In fact for most of my childhood, our tree was white (to resemble a snow-covered tree) adorned with blue ornaments. (Which in fact worked out quite nicely since blue and white are the Chanukah colors, and my family celebrated a mish-mash of Chanukah and Christmas). But living on my own I wanted a tree. So we saved our money and bought one. And every year since, we’ve had a live tree. This year it was our son who found the “perfect” tree. 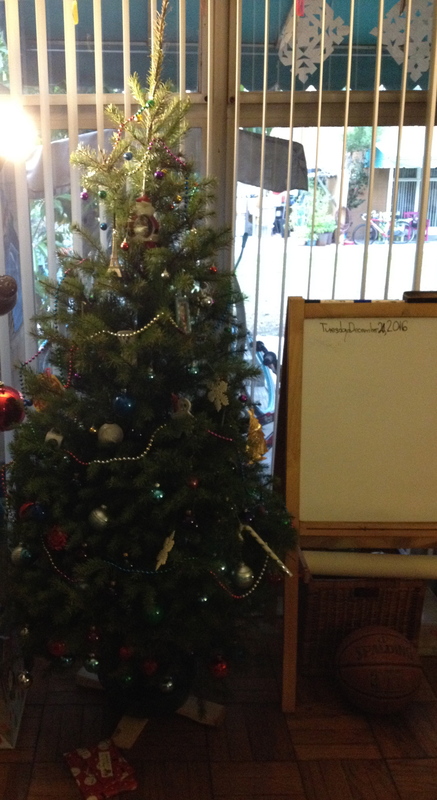 And this year it was mostly our eight-year-old son who decorated the tree. But that’s what makes the tree become our tree.